If you are the kind of person who never wants to settle for the ordinary, then custom cabinets are definitely for you. Simply put, you will not find an off the shelf cabinet that comes close to the quality and workmanship you get from a custom cabinet made by Danner’s Cabinets. Period! Choosing a custom cabinet gives you the freedom to make your dreams a reality. You are not bound by a preset range of choices for wood, color or style. We can design a cabinet that makes good use of all available space where a non-custom or modular cabinet can only leave you hoping that it works well. Additionally, even if you find something that fits into the space you have, it might not work with the rest of the room in terms of color and style. 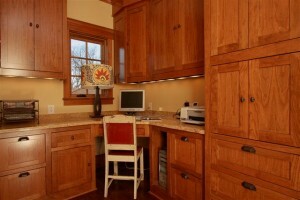 Hand-crafted custom cabinetry has a lot of pros and virtually no cons. Of course, they will last for decades. That’s a given. Beyond that, your cabinetry will be a joy to look at and they will be the most beautiful, functional and durable cabinets you will ever use. Custom cabinets are made the way you want them. Everything is built to your EXACT specifications for measurement, shape, hardware and wood choice. All the way down to minute details in the design, all are according to your needs and wants. You may select virtually any look, finish or wood that you wish, and we will craft your custom cabinets to suit. You are 100% involved in the design process. You decide everything. The entire project flows from your vision and everything we do will be based on your initial specifications. Your input is critical to the project and we will not make any final design decisions without first consulting with you. Danner’s Cabinet Shop uses specialized cabinet software to provide our clients with drawings to their specifications. We can draw up the design for you or help you design a cabinet based on your ideas, sketches and measurements. Your home is your greatest investment. When it comes time to remodel why put anything but the best in your investment? So, before you go down to the nearest strip mall or local furniture store to pick out cabinetry that has been created, shipped, and sold within a week, take a moment to consider your investment. Wouldn’t it be much better to purchase real hand crafted cabinetry that will last for many decades? And they will certainly outlast anything you could find at your local showroom. We employ only the most highly skilled cabinetmakers who are trained and experienced in the true art of cabinetry for new construction and remodeling projects. We assist customers with their cabinet needs when finishing basements, remodeling homes and offices, or cabinets for a variety of applications. The custom work we have done includes hutches, entertainment centers, bars, vanities, bookcases, and more. We will counsel you on layouts and uses that we have found are most effective and efficient in our experience. We will work with you to maintain your budget targets and will not sell you something you don’t need if it doesn’t fit into the scope of the project. Contact the design experts at Danner’s Cabinet Shop today at 763 753-4002. We can schedule an appointment with you and come out to your home or business to help you work through the design process. We will produce a computer drawing for your approval and then work can begin. We build custom cabinets for everyone in Minnesota, including those in Andover, Anoka, Blaine, Bloomington, Chanhassen, Chaska, Corcoran, Deep Haven, Eden Prairie, Edina, Elk River, Ham Lake, Maple Grove, Medina, Minnetonka, North Oaks, Plymouth, Ramsey, Richfield, Rogers, Shakopee, Shorewood, St. Paul, and Wayzata.